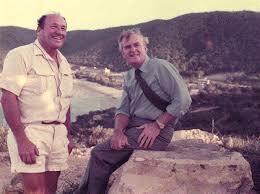 Fifty years ago this month my wife and I got married on the Queensland Gold Coast. The weekend of the wedding was also the inaugural race meeting at the Surfers Paradise International Raceway, designed, created and constructed by Keith Williams. I had to explain to my new wife that however important our wedding was, I had made an obligation to Keith to lead the commentary team for the first race meeting. 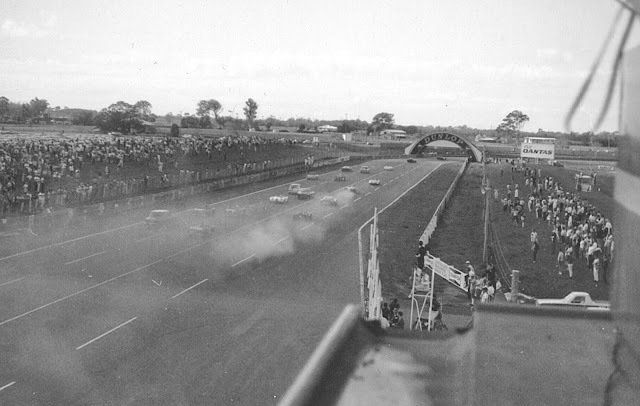 The opening of this circuit was a big deal in Australian motor racing, and Keith had managed to convince Jack Brabham to bring a Brabham-Repco Formula One car to the track and drive a few demonstration laps, to attract publicity. Mind you, this was just before the start of the 1966 Formula One season, with the opening round at Monaco in May, so I’m sure Jack was just a bit preoccupied! 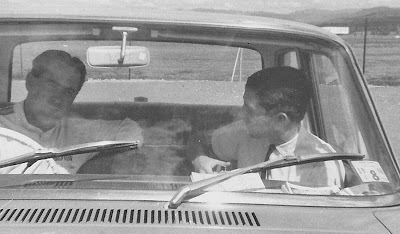 True to his word Jack arrived at the track with a Repco V8-engined BT19, and in addition to driving demonstration laps of the circuit, he agreed to an interview with me, published in Racing Car News. 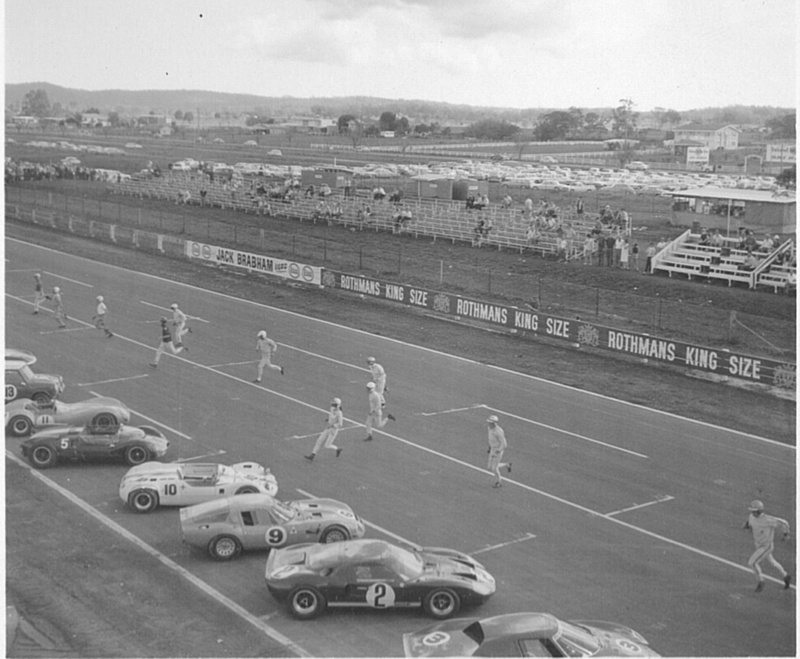 I returned to the circuit in August 1966, to join the commentary team for the inaugural 12 Hour Sports Car race, part of ‘Speed Week’ in Surfers Paradise. 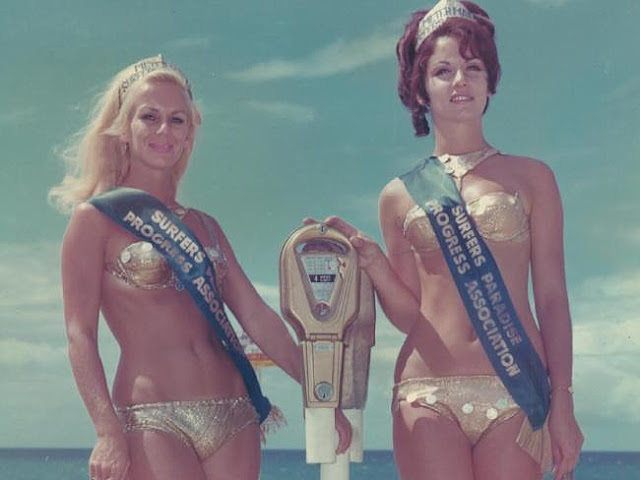 Surfers Paradise was also getting national publicity at the time, after the Head of the Progress Association decided to hire ‘Meter Maids’ in gold bikinis to insert coins in parking meters to stop tourists from getting parking fines! The entry list for the 12 Hour Race was made up of a very strange assortment of cars, including Ferraris, a Ford GT40, some Austin Healey Sprites, a Falcon (!) and a couple of Mini Cooper S, along with a bedraggled list of Australian, home-built ‘Specials’ – which amazingly all qualified as ‘sports cars’ for this inaugural event. 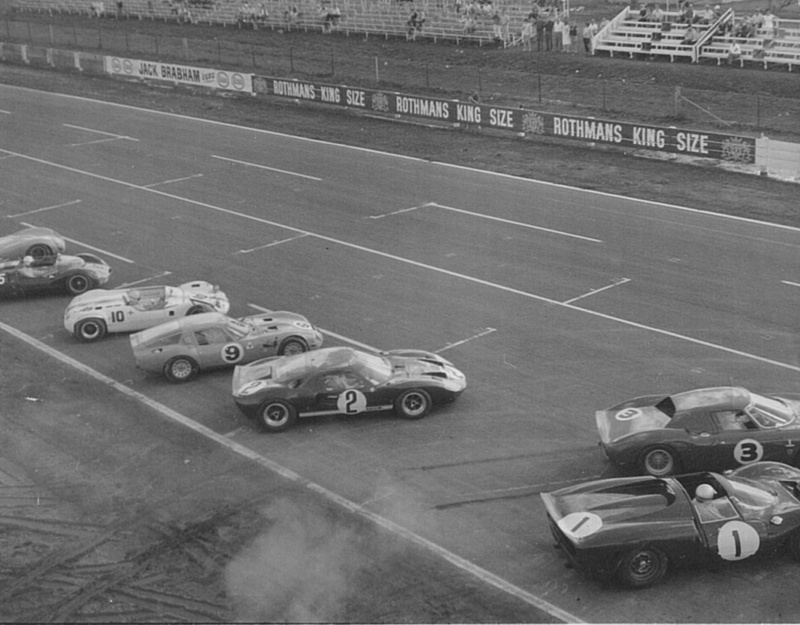 From the top of the control tower, and using a camera borrowed from my mate Stewart Johnson, I managed to snap off four photos of the start of the race. My starting grid photos show the drivers poised for the Le Mans-style start; sprinting across the track; and a clear shot of Jackie Stewart getting away first, putting daylight between him and David Piper’s Ferrari P2 and Frank Matich in the Ford GT40. The last photo shows the field disappearing under the Dunlop Bridge. 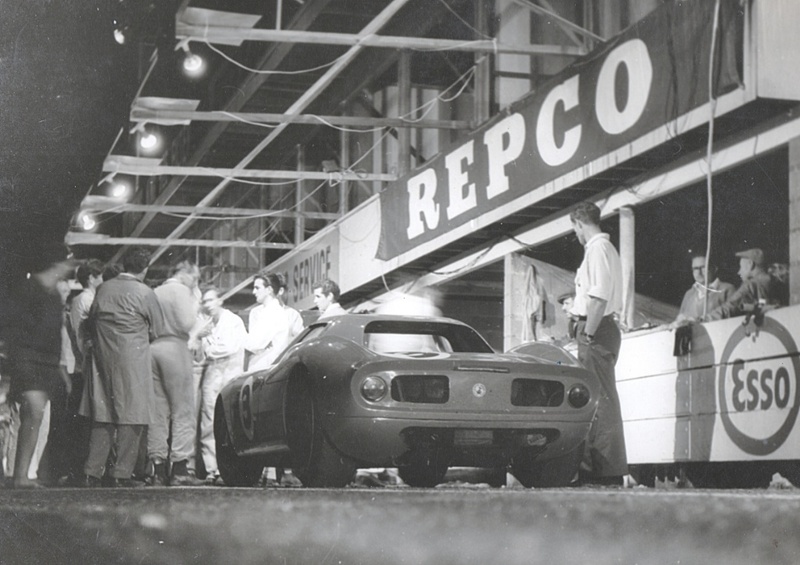 A Ferrari 250LM, entered by my friend David McKay’s Scuderia Veloce team, and driven by Jackie Stewart and New Zealander Andy Buchanan won the race, but only after a lengthy pit stop early in the evening to sort an ignition problem. 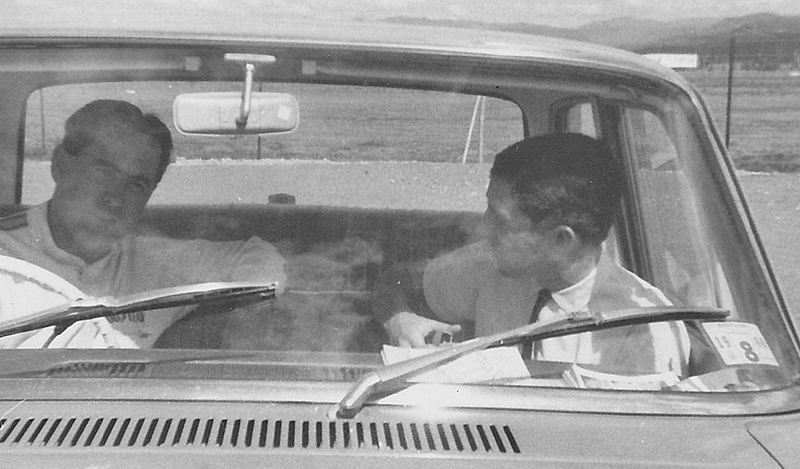 My thanks to Stewart for unearthing these photos from his vast collection, because as I was using Stewart’s Box Brownie, I never did get a copy of the photos until recently in this year of celebrating my 50th year of marriage. 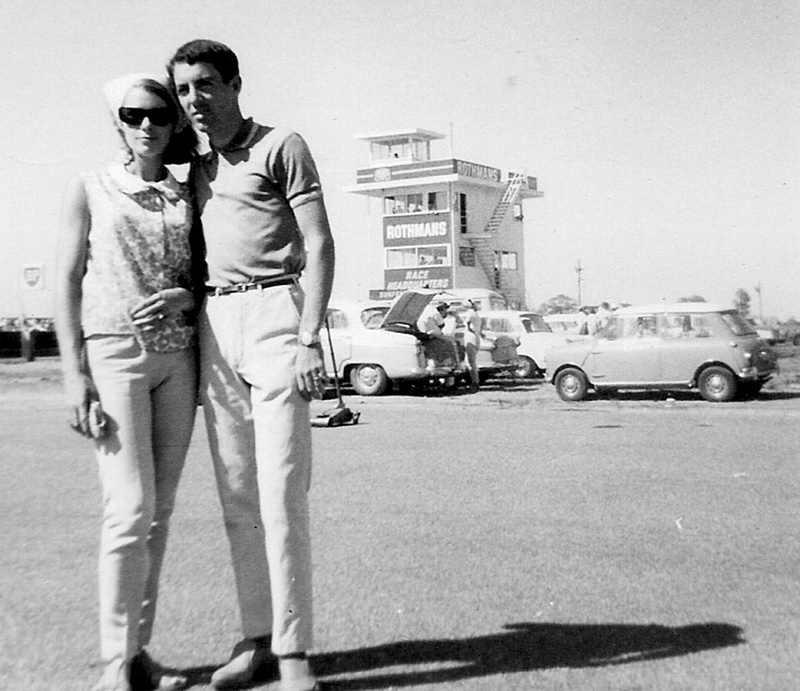 Our marriage has certainly outlasted the Surfers Paradise International Raceway, which continued until 1987. 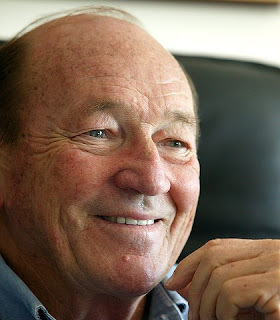 Keith Williams sold it in 1983 to fund his new development of Hamilton Island on the Great Barrier Reef, and the circuit stumbled along for four more years. 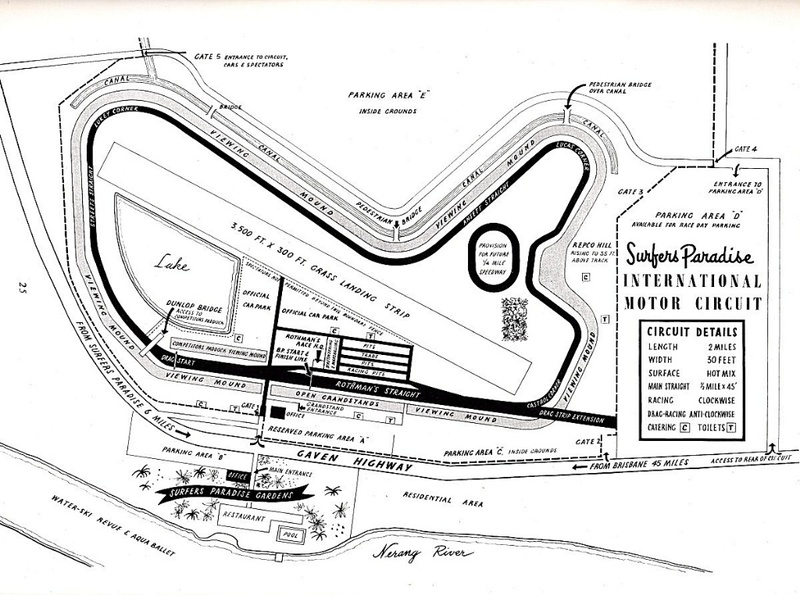 In 2003 the entire circuit complex was bulldozed to make way for the Emerald Lakes housing development. 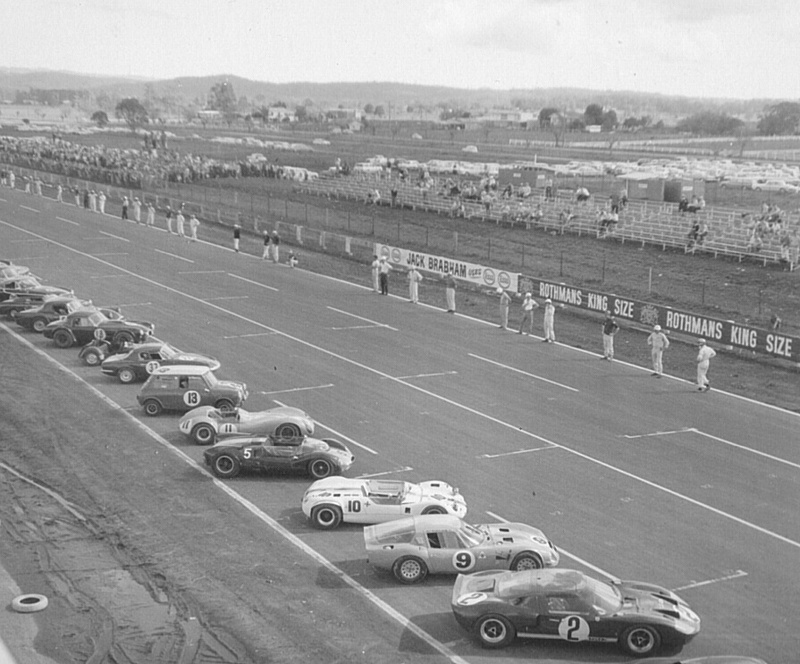 It was a short, but bright star in the firmament of Australian motor racing, and I’m delighted to have played a small part in its success. 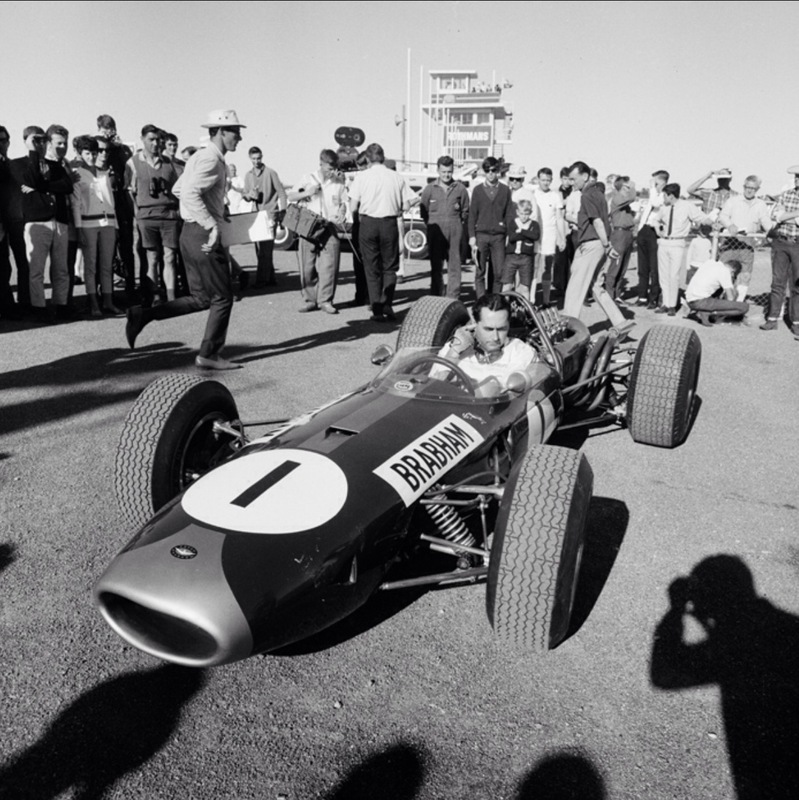 Jack Brabham scored three pole positions, and won four Grands Prix in a row, winning both the Drivers' and Constructors' Championships! 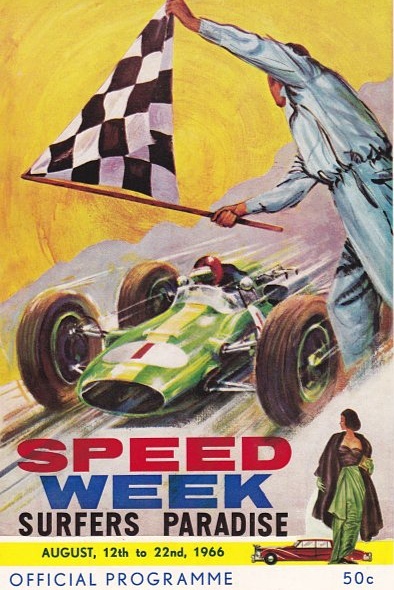 Not bad for the Brabham-Repco's inaugural season!